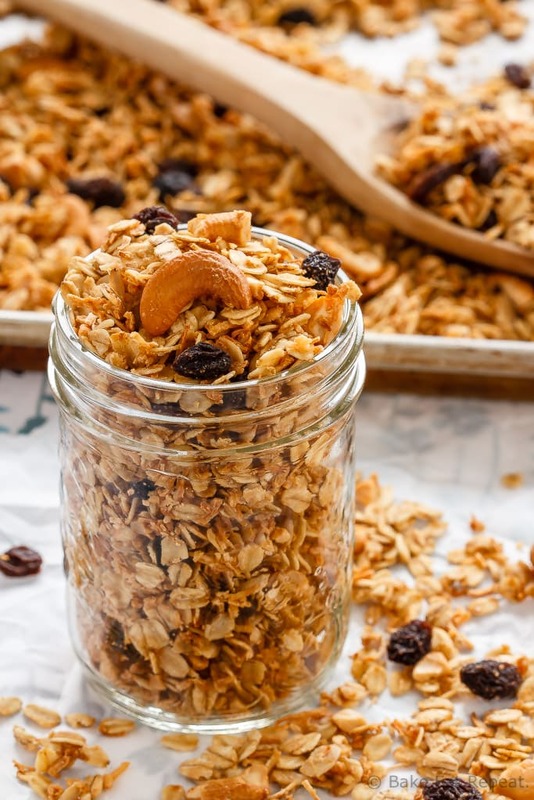 This homemade coconut granola is so fast and easy to make and is easily customizable. Healthy and delicious, it’s the perfect breakfast or snack! 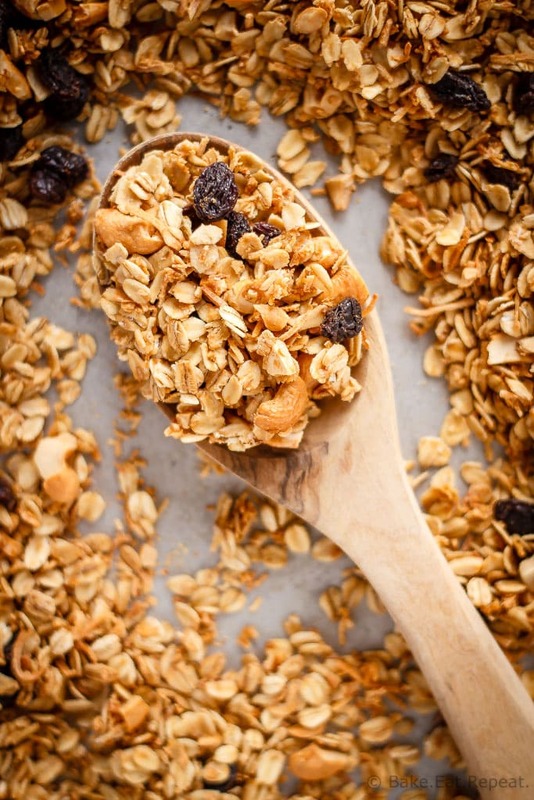 Homemade granola – it is definitely one of our favourite things. The store bought kind just doesn’t compare. 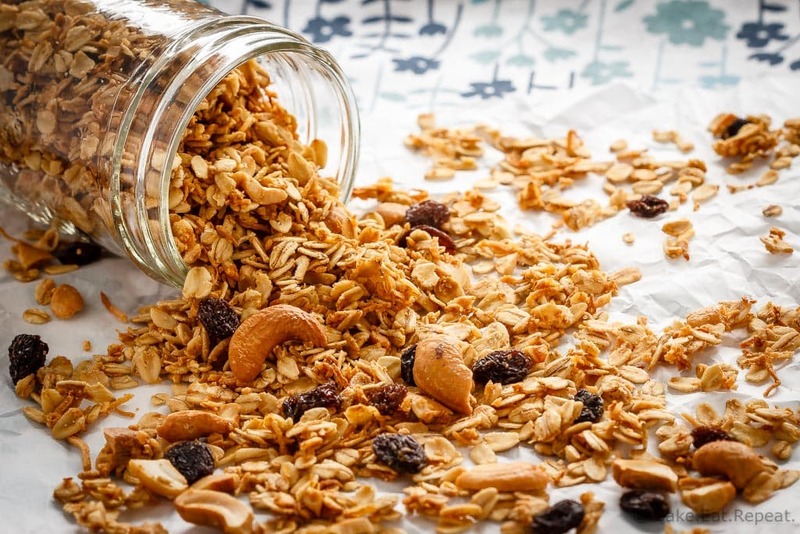 Homemade granola is just so quick and easy to make, it almost seems silly to buy it. Not that that stops me from buying it occasionally – when I get lazy and see it and think, yeah, that’ll be just as good, and way faster then homemade. Then we have it for breakfast and I change my mind, realizing it’s not just as good as homemade, and it really wasn’t all that much faster. Ignoring baking time of course. This coconut granola does take a while to bake, but really, you’re not doing anything when it’s baking so that doesn’t count. And the prep time is maybe ten minutes. Maybe. So fast and so easy, whenever I buy it I wonder why on earth I didn’t just come home and make some homemade granola instead. Because homemade is always better. This coconut granola is one of our favourites. 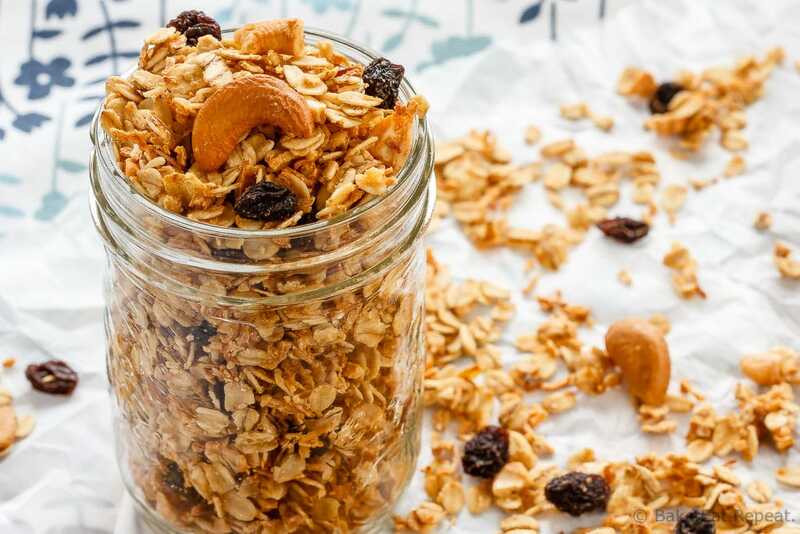 I’ve made many different versions over the years (like this Pumpkin Spice Granola and this Cherry Almond Granola), but this coconut granola recipe is usually my starting point when I’m trying out a new flavour. It’s so easily customizable, and it’s just the right combination of sweet and crunchy, without using a huge amount of sugar and oil in it. This last batch of coconut granola actually disappeared so fast, I don’t think I got any. I feel like that’s a tad bit ridiculous considering the recipe makes 7 cups of granola. It’s not like I made a tiny amount! Evidently I’m not alone around here in my love of homemade granola. Also, I need to start hiding things if I want any. this recipe is easily customizable – use a different oil, different nut, different dried fruit – as long as the ratios of liquid to dry ingredients stays the same it will work out! I’ve also shared this Coconut Granola recipe over on Food Fanatic. love home made granola.. this coconut version sounds delicious. definitely will be making the recipe! Yup, it's delicious! I still need to try your granola recipe - adding espresso to my granola needs to be the next combination I try, that's an amazing idea!